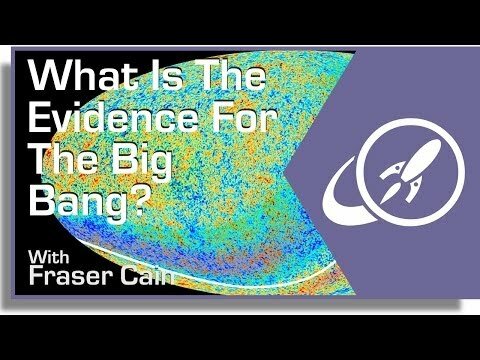 Almost all astronomers agree on the theory of the Big Bang, that the entire Universe is spreading apart, with distant galaxies speeding away from us in all directions. Run the clock backwards to 13.8 billion years ago, and everything in the Cosmos started out as a single point in space. In an instant, everything expanded outward from that location, forming the energy, atoms and eventually the stars and galaxies we see today. But to call this concept merely a theory is to misjudge the overwhelming amount of evidence. There are separate lines of evidence, each of which independently points towards this as the origin story for our Universe. The first came with the amazing discovery that almost all galaxies are moving away from us. In 1912, Vesto Slipher calculated the speed and direction of “spiral nebulae” by measuring the change in the wavelengths of light coming from them. He realized that most of them were moving away from us. We now know these objects are galaxies, but a century ago astronomers thought these vast collections of stars might actually be within the Milky Way. In 1924, Edwin Hubble figured out that these galaxies are actually outside the Milky Way. He observed a special type of variable star that has a direct relationship between its energy output and the time it takes to pulse in brightness. By finding these variable stars in other galaxies, he was able to calculate how far away they were. Hubble discovered that all these galaxies are outside our own Milky Way, millions of light-years away. So, if these galaxies are far, far away, and moving quickly away from us, this suggests that the entire Universe must have been located in a single point billions of years ago. The second line of evidence came from the abundance of elements we see around us. In the earliest moments after the Big Bang, there was nothing more than hydrogen compressed into a tiny volume, with crazy high heat and pressure. The entire Universe was acting like the core of a star, fusing hydrogen into helium and other elements. This is known as Big Bang Nucleosynthesis. As astronomers look out into the Universe and measure the ratios of hydrogen, helium and other trace elements, they exactly match what you would expect to find if the entire Universe was once a really big star. Line of evidence number 3: cosmic microwave background radiation. In the 1960s, Arno Penzias and Robert Wilson were experimenting with a 6-meter radio telescope, and discovered a background radio emission that was coming from every direction in the sky – day or night. From what they could tell, the entire sky measured a few degrees above absolute zero. Theories predicted that after a Big Bang, there would have been a tremendous release of radiation. And now, billions of years later, this radiation would be moving so fast away from us that the wavelength of this radiation would have been shifted from visible light to the microwave background radiation we see today. The final line of evidence is the formation of galaxies and the large scale structure of the cosmos. About 10,000 years after the Big Bang, the Universe cooled to the point that the gravitational attraction of matter was the dominant form of energy density in the Universe. This mass was able to collect together into the first stars, galaxies and eventually the large scale structures we see across the Universe today. These are known as the 4 pillars of the Big Bang Theory. Four independent lines of evidence that build up one of the most influential and well-supported theories in all of cosmology. But there are more lines of evidence. There are fluctuations in the cosmic microwave background radiation, we don’t see any stars older than 13.8 billion years, the discoveries of dark matter and dark energy, along with how the light curves from distant supernovae. So, even though it’s a theory, we should regard it the same way that we regard gravity, evolution and general relativity. We have a pretty good idea of what’s going on, and we’ve come up with a good way to understand and explain it. As time progresses we’ll come up with more inventive experiments to throw at. We’ll refine our understanding and the theory that goes along with it. Most importantly, we can have confidence when talking about what we know about the early stages of our magnificent Universe and why we understand it to be true. It’s “merely a theory” like gravity, relativity and evolution. Scientists use the term “theory”, so I wanted to hold with their terminology, but also help people understand how seriously we should take these arguments. You can’t do much better than 4 separate lines of evidence that independently prove the same thing. But it is called the “Theory of the Big Bang”, so we have to embrace that terminology. My point is that there are two uses of the word “theory.” One is the scientific usage and the other is common usage. People often confuse the two and use this misunderstanding to argue against scientific theory. The Theory of Evolution is a perfect example of this. In contrast a scientific theory is a more formal term and for something to be called a theory it requires a systematic approach to the examination and testing of evidence. So that’s why I don’t think it’s fair to say that a scientific theory is “merely a theory.” If it is a scientific theory then it is the result of rigorous investigation by some pretty smart people and has held up well. Perhaps it’s a nit but I hate to see anything that perpetuates this confusion. A solid theory with substantial evidence to support it. This is why as a child, I was captured by it’s beauty and it’s big mysteries. We’ve come along way in the past century, we’ve achieved a lot and there is so much more to discover and to achieve. There are no galaxies traveling at the speed of light. It might appear that way due to the dark energy infusion spreading the universe apart, but the galaxies speed through space is nowhere near those speeds. Galaxies can move away from us faster than the speed of light. Nothing can move through space faster than light, but space itself can expand faster than light. I have created the lost form of PERFECT & FLAWLESS MATHEMATICS!!! Although no-1 will believe me, I can map the universe with mathematics & not only prove the big bangs shock wave through all of time & space, but we also, as everything in universal physics rotates with-in & around other objects, orbit around a universal core as we simply gain distance from other galaxies due to orbital patterns. I would enjoy a chance at some-1 viewing my perfect mathematical system, for N.A.S.A. has not yet said I’m wrong after I freely e-mailed them the way to create perfect mathematical patterns that contain 1,000’s of anomalies that only appear at main cross check points of time & space, as the anomalies show a wave pattern that is perfectly predictable & continues from the mathematical creation of time/space til the mathematical end! I welcome any-1 to have better balanced mathematical proof than I.
P.S. My mathematics, I believe, can also de-code the Mayan stone as well as the many Pyramids world wide, among other things! But who’ll believe or listen to a no-1 like me? Mr. Cain, I was wondering if you would be interested in looking at the Mathematical system I posted, I have much more & I’m seeking some1 to share credit in building the 1st true universal model based off a perfect mathematical system & basic physics. I 100% know this is the lost math of the old world, & will change the future. I’m making this offer to U. of M. next. It may be Nobel prize worthy? “Once a really big star” – Wasnt this also a singularity? I mean of course it passed the “really big star” stage as t>0 , but before that, doesnt the theory say that it sprang out of a singularity? Or does it start out in the “big star” phase and grows from there? Curious! Expansion from a single point in space seems to oversimplify the nature of the birth of our universe. There was no space at the beginning. Not a single point. No space, just energy. Then space was born into at least three dimensions. There are hypotheses, but no solid evidence, that space existed as only one dimension at any point in time (pun intended). O.K. since I have share your experiences and frustration, I’ll look over your work. How would I get to look it over? I TRULY THANK YOU for listening to a “no-1” like myself!! I had to sound “cocky” to get some-1’s attention, but I’m honestly not like that in person! I’ll send you what I feel is the basics, the math continues flawlessly, it was not til I noticed it resembled the Mayan math cycles that I began to picture it as a mathematical universal map, but it fit so perfect I honestly now believe in the Mayan myths. I don’t know why, but after running numbers for days at a time, I have a whole new view of history & question many historical details I always believed, until now. I found many hundreds of inner-twined math anomalies while charting the power consumption & power creation over distance & various speeds of my electric s.u.v. design, so my O.C.D. for math took over. you’ll have to forget everything you know about modern math & return to the basics, for I believe modern math tries to get around the anomalies to where perfect math finds & eliminates them, so plz follow my instructions, at 1st you’ll think it’s crazy but you must eliminate the problem to find simple math. I’ll find a simple way to explain it thru e-mail & send it today, but be warned, it’s not what you’re used to, but you’ll see the powerful patterns in every direction & cross reference’s that continue exactly the same if you do it correctly & enter it with a open mind. I believe all the anomalies in our math are caused by a universal “wave” in time & space, be it a sound wave or other. They follow to perfect of a pattern as many key mathematical numbers related to time & space add up, down &/or divide into two diff. answer’s as if they are the same, if you eliminate ALL the anomalies, mathematics is perfect! Do not allow any-1 access to this w/ out my approval, it is mine for now & I have filed copy rite’s to it. Thank You!!! I have not heard from you, if you found a problem let me know, I know the system so well I changed a number so it’ll still add up, but you will not get all the wave pattern. But it should still impress any1 never the less. Seems that your model is self contradictory. Set up a free posting of your work, such as word press so others can see it. I didn’t mean forget EVERY THING you know of math, this is so perfect you wont need anything but basic math. If you add & write the numbers by hand, you’ll witness things you never seen math do before where math anomalies used to be! I will not give away my secretes to decode it, but I do know how to!!! since I filled copy rites already, I do intern to go public soon due to the fact I’ll be homeless w/in 10 days, I seek help from some1 in the physics world to help gain attention, I KNOW the universe is in a orbit ect…, my black hole theory is based on: we have no universal sun & a black hole is all I know that has gravitational force enough to drive the universal rotation, also math shows time & space do not exist there, it only maps the centers size based on it’s O.D..
the end numbers are the universes echoing heart beat & the middle is the universal wave. I understand it 100% & specific old anomaly numbers even give away it’s secretes. the cycles on Gaia wave pattern match on the 12’s, the 88…. keeps the heart beat echo of “50” but it’s a true 88.0, continue 9,999,999,999. more time & help me get a grant for I OWN THIS BY LAW!!! The Terra cycle is every 7th number from the Gaia cycle. I have way to much info to share on-line but I offer some shared credit to any1 who truly helps me for this can do so much to de code many things. p.s. I slightly changed 3 things so any1 who steals it cant do everything I can, GOOD LUCK!